TBILISI, DFWatch–Four prominent members of Saakashvili’s National Movement who recently left the party are planning to start a new movement. DF Watch spoke with Mikheil Machavariani, who is one of the most high profile members of the National Movement. We asked him why the four decided to leave the party, how much other party members knew beforehand and how they will get along in the future. Mikheil Machavariani: Unfortunately, we never knew about this issue beforehand, and it was really unpleasant when we learned about it. I expect that they will state their reasons. I hope that those people will state different reasons from those who left UNM in the past. You probably remember that some said it was business, some interests, this or that. I hope it won’t be the same now, because we went through a great struggle together. DFW: Was there ever an expectation that they would leave the party? M.M: I will refrain from answering that question. Let’s see how events develop. It is really unpleasant, but such things always happen in politics. I agree that their versions and explanations are very interesting, because they weren’t just ordinary party members. DFW: But still, was there an expectation that at least someone would leave? M.M: Whether there were any expectations and what has happened inside the party, I don’t want to discuss it now. I can assure you that there was never discussed what happened yesterday. We learned about it on Sunday and it was really surprising, because we never expected it. No discussions or any signs of it. DFW: How did they notify the party about their decision? Was it by letter, or phone conversation or did you meet? M.M: No they met our friends and told them they were planning to leave. DFW: Which friends, inside the party? M.M: Yes, they spoke with party members. DFW: And they didn’t mention the reasons for leaving to them, or did UNM members ask them anything? M.M: No they didn’t say, and we didn’t ask. They said they would explain on Wednesday. We wanted to know how they were planning to leave us – do they leave politics, do they want to avoid active political life or do they want to create a new movement and remain in parliament. They responded that they plan to create a new movement. 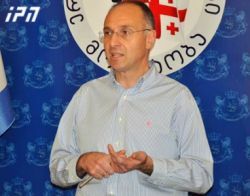 DFW: There is an assumption that Giorgi Vashadze wanted to be secretary general of the party, which caused a confrontation. M.M: No. I can tell you that this couldn’t have been the reason, because Zurab Japaridze was unanimously elected to this post, and in the end Vashadze changed his mind and asked for the position as organizational secretary. The election of Zura happened with no alternatives, unlike me. DFW: Do you plan to cooperate with these people? M.M: There are different viewspoints and ways of seeing it inside the party. One thing is what your heart tells you to do, but another thing is what your cool mind tells you to do. You are a politician because you shouldn’t make a decision by hot mind and cold heart. A decision should be made by a cool mind and a hot heart, so we should wait for their statements. But this was very unpleasant and this decision let our enemies smile confidently, for the time being. But in fact, those people do not have reason to smile, because there are much bigger problems in the country than from those four leaving their party and their faction. DFW: Can their leaving somehow create problems inside the party? DFW: All four of them are quite different kinds of personalities. How can you explain that they left together? M.M: I don’t know. I don’t want to guess now, but the reality is that we chose a different path and we still have political prisoners, but everyone has their own responsibility and we have to wait. I cannot allow myself to get angry right now. DFW: What about the allegations that they were subject to pressure? M.M: I don’t want to make statements prematurely, based on assumptions. As I said, let’s wait and see how this develops.